Write, stick, done! For stylish labelling of jars, boxes, cans and a lot more. 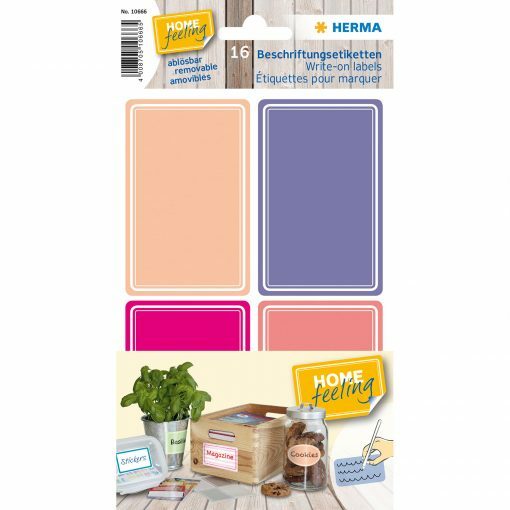 HERMA write-on labels adhere firmly to cardboard, plastic or any other surface. Afterwards they can be peeled off without a trace, without damaging the support. Environmentally friendly: chlorine-free bleached, solvent-free adhesive. Label format 52×82 mm, 16 labels per pack. Can be written on with all writing utensils and typewriters. • HERMA write-on labels adhere firmly to cardboard, plastic or any other surface. • Environmentally friendly: chlorine-free bleached, solvent-free adhesive. • Label format 52×82 mm, 16 labels per pack. • Can be written on with all writing utensils and typewriters.